Collector for ArcGIS is a convenient way to integrate geographic data collection with your existing ArcGIS platforms. This mobile application works with ArcGIS Online to remotely collect and add data to an existing map in real-time. But with the release of the new Collector app (still in beta for Android users), GIS enthusiasts all over the world have been facing the same burning question: what’s the difference between Collector and Classic? To find out, I used both apps on my iPhone to collect data on gas stations in Annapolis County, Nova Scotia. First, I set up a hosted feature class with custom domains (click here to learn more) to collect my gas station point data. Fields were created for the station’s brand name, the number of gas pumps, and the price of gas ($/L). After loading the feature class into a web map, I added a pop-up field that converts the price of gas to dollars per US gallon ($/Gal) using an Arcade expression. This will be used to test Collector’s support custom Arcade expressions. Our comparison starts with the opening map interface of both apps. While Classic and Collector have similar opening interfaces, Collector has a notably cleaner design paired with improved functionality. The GPS accuracy gauge in Collector has moved to become an informative header with clear text warnings, and the ‘add data’ button has re-located to a well-placed widget. Collector also added a handy compass feature to the location widget that orients the map to your direction. Finally, the location target around your point is now a default feature in Collector, allowing you to place points more precisely than in Classic. Next, we’ll compare how points are collected in each app. The first notable difference after pressing the ‘add data’ button in Collector is your map visibility. While Classic uses a full-screen form to enter data, you can swipe Collector’s form up or down to reveal or hide your map. This eliminates having to switch between the form and map screens and makes it easier to update the location of your point on the spot. Collector’s improved interface not only looks better but also makes adding photos and other attachments a one-stop shop compared to navigating multiple pages in Classic. Finally, Collector uses its screen-space more efficiently than Classic when collecting data, and without overcrowding. I especially appreciate Collector’s balance of good looks, increased usability, and less white-space! Our final comparison looks at viewing previously collected data. 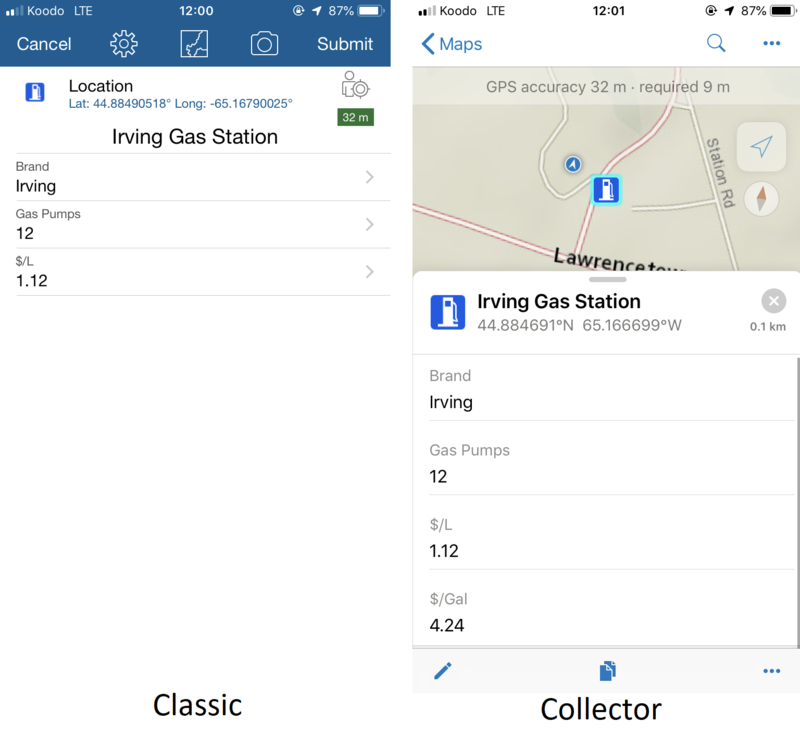 Similar to collecting data, the first significant difference between the apps is map visibility when viewing a pop-up in Collector. Seeing your point’s location while viewing its associated data adds a much-needed spatial component to viewing your data. Although you can look at your points in Classic too by switching to the map screen, Collector’s default map-form combination makes the experience much more similar to how your data will be viewed on other ArcGIS platforms. Last but not least is Collector’s ability to display Arcade-generated fields in your pop-up. This feature not only allows you to see custom fields (in real-time) in addition to the ones you entered, but it also ensures that your pop-ups look nearly identical to your web map. Note how my Arcade expression to convert the price of gas is visible in Collector, but not in Classic. 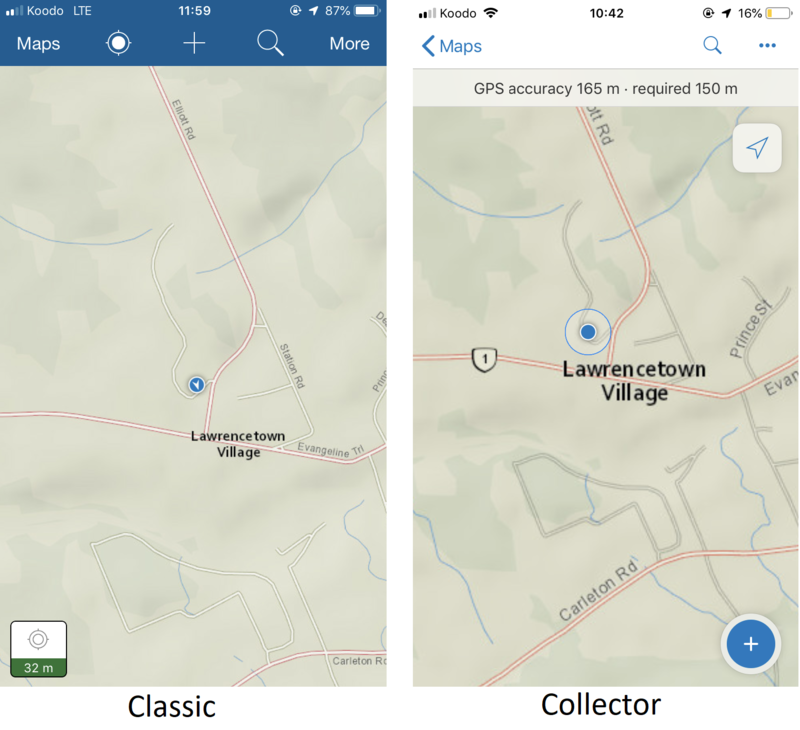 Now I’ll be the first to acknowledge that this comparison only scratches the surface of Collector’s new features (click here or here for better overviews), but I wanted to give a user perspective on how both apps compare. 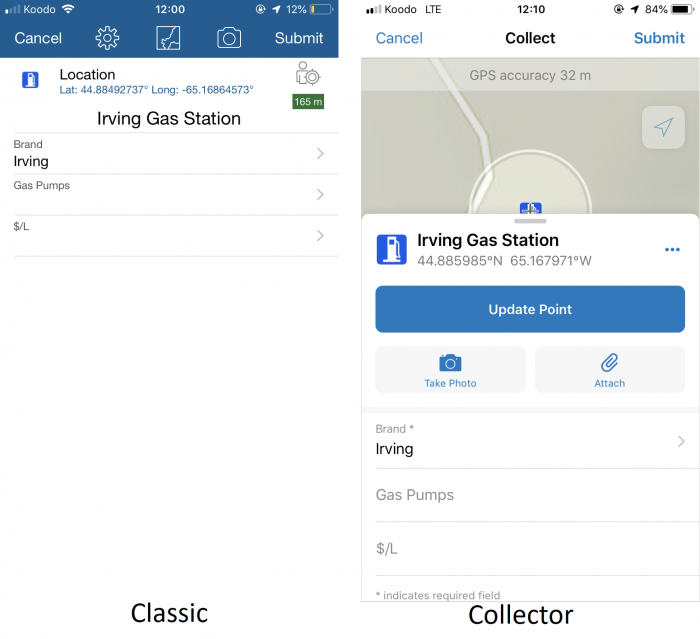 To put it simply, the new Collector app is sleeker, more user-friendly, and provides an experience that’s more similar to your existing ArcGIS platforms. My favourite new feature by far is the direct integration of maps in the data collection form. This simple re-design not only excites us geography geeks, but also adds such practical functionality over switching from screen to screen. But for those who still prefer using Classic, fear not; if other new Esri products are any indication, you’ll be able to keep using Classic for the foreseeable future.